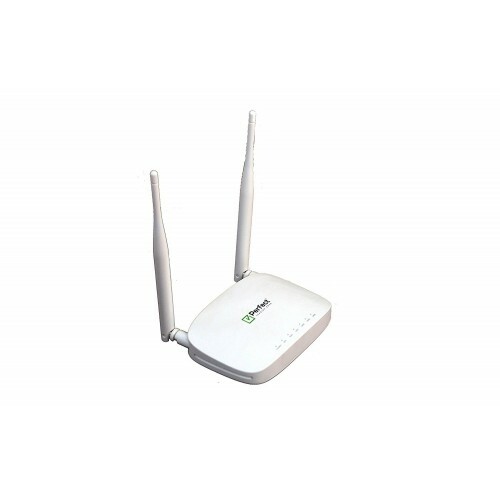 PFTP-WR300 is a 300mbps wireless broadband router from PERFECT comprises of IEEE 802.11 b/g/n wireless standards provides you with a smooth uninterrupted internet connection. The easy setup wizard helps user to configure the router in a very user friendly way. Supports advanced wireless security protocols like WEP, WPA, and WPA2 which encrypts your private data and gives a secure internet access. Not getting signal in the corners of your home or office? switch to repeater mode and rebroadcast the existing network for extended coverage. Maximum internet speed of upto 300 mbps. Powerful two external Omni-directional antennas of 5dBi gain each, gives you wide wifi coverage. Wireless Protected Setup – don’t type password just press the buttons (more protection). Improved version of IPV6, lengthened from 32 bits to 128 bits.